During the therapy, a constant warm and humidified air flow, if required combined with oxygen, is applied into the nose of the patient by means of thin nasal prongs (applicator). This always leads to an improved ventilation. 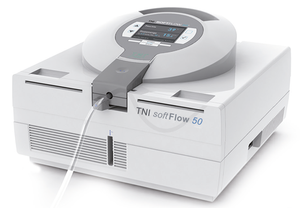 The Therapy with Nasal Insufflation has a high level of therapy acceptance and excellent therapeutic success. The findings especially recommend the Therapy with Nasal Insufflation as a therapy option for a further reduction of a mechanical respiratory support or for patients who do not accept the usual mask ventilation.